Thomas à Kempis, also known as Thomas Hämerken (1380 - 1471), was a Renaissance Roman Catholic monk and author of The Imitation of Christ, one of the most well-known Christian books on devotion. Thomas was born at Kempen in the duchy of Cleves in Germany around 1380. He was educated by a religious order called the Brethren of the Common Life, and in due course joined the order, was ordained a priest, and became sub-prior of his house, where he died in 1471. He is known especially for composing or compiling his manual of spiritual advice, The Imitation of Christ, in which he urges the reader to seek to follow the example of Jesus Christ and to be conformed in all things to his will. Although he was never declared a saint, his writing has served as a inspiration to millions of Christians. 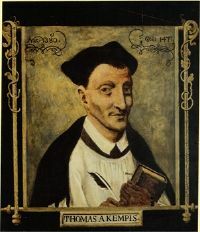 Thomas à Kempis was born in Kempen, Germany, 40 miles northwest of Cologne, in 1380. He died near Zwolle (52 miles east-north-east of Amsterdam) in 1471. His paternal name was Hemerken or Hämmerlein, meaning "little hammer." In 1395, he was sent to the school at Deventer conducted by the Brethren of the Common Life. He became skillful as a copyist and was thus able to support himself. 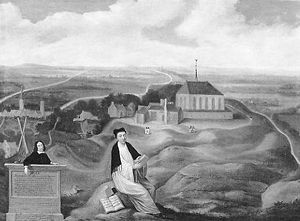 Later he was admitted to the Augustinian convent of Mount Saint Agnes near Zwolle, where his brother John had been before him and had risen to the office of prior. Thomas received priest's orders in 1413 and was made subprior in 1429. The house was disturbed for a time in consequence of the pope's rejection of the bishop-elect of Utrecht, Rudolph of Diepholt. Otherwise, Thomas' life was a quiet one, his time being spent between devotional exercises, composition, and copying. He copied the Bible no less than four times, one of the copies being preserved at Darmstadt in five volumes. He was widely read in the Bible's teachings, and his works abound in biblical quotations, especially from the New Testament. Thomas belonged to the school of mystics who were scattered along the Rhine from Switzerland to Strasburg and Cologne, and in the Netherlands. He was especially influenced by Geert Groote and Florentius Radewijns, the founders of the Brethren of the Common Life. His writings are all of a devotional character and include tracts and meditations, letters, sermons, a life of Saint Lydewigis (a Christian woman who remained steadfast under a great stress of afflictions), and biographies of Groote, Radewijns, and nine of their companions. Works similar in content to the Imitation of Christ include his prolonged meditation on the life and blessings of the Savior and another on the Incarnation. Both of these works overflow with adoration for Christ. Thomas' works are abound in quotations of the New Testament. Under an old picture, which is represented as his portrait, are the words, "In all things I sought quiet, and found it not save in retirement and in books." The words fit well the author of the famous Imitation of Christ, as the world thinks of him. Imitation of Christ is a writing of the mystical German-Dutch school of the fourteenth and fifteenth centuries. It is a widely read Christian spiritual book. The book was first published anonymously, in Latin, ca. 1418; several other authors have been proposed, but Kempis's authorship is now generally accepted. Together with the Confessions of Augustine and John Bunyan's Pilgrim's Progress, the Imitation of Christ occupies a front rank among manuals of Christian devotion. Protestants and Roman Catholics alike join in appreciating it. The Jesuits give it an official place among their "exercises." John Wesley and John Newton listed it among the works that influenced them at their conversion. General Charles George Gordon carried it with him to the battlefield. The number of counted editions exceeds 2,000, with 1,000 different editions preserved in the British Museum alone. The Bullingen collection, donated to the city of Cologne in 1838, contained, at the time, 400 different editions. Some 545 Latin and about 900 French editions are known to exist. The book was written in Latin, but only a French translation from 1447 survived and exists as a hand-written manuscript. The first printed French copies appeared at Toulouse in 1488. The earliest German translation was made in 1434 by J. de Bellorivo and is preserved in Cologne. The editions in German began in Augsburg in 1486. The first English translation (1502) was by William Atkinson and Margaret Beaufort, mother of Henry VII, who did the fourth book. Translations appeared in Italian (Venice, 1488; Milan 1489), Spanish (Seville, 1536), Arabic (Rome, 1663), Armenian (Rome, 1674), Hebrew (Frankfort, 1837), and other languages. Pierre Corneille produced a poetical paraphrase in French in 1651. The Imitation of Christ derives its title from the heading of the first of four books, De imitatione Christi et contemptu omnium vanitatum mundi. It seems to have been written in meter and rhyme. The four books are not found in all the manuscripts, nor are they arranged invariably in the same order. The work is a manual of devotion intended to assist the soul with its pursuit of holiness and communion with God. Its sentences are statements, not arguments, are pitched in the highest key of Christian experience. It was meant for monastics and ascetics. Behind and within all its reflections runs the counsel of self-renunciation. The life of Christ is presented as the highest study possible to a mortal. His teachings far excel all the teachings of the saints. The book gives counsel to read the scriptures, statements about the uses of adversity, advice for submission to authority, warnings against temptation and how to resist it, reflections about death and the judgment, meditations upon the oblation of Christ, and admonitions to flee the vanities of the world. Christ himself is more than all the wisdom of the schools and lifts the mind to perceive more of eternal truth in a moment of time than a student might learn in the schools in 10 years. Excellent as these counsels are, they are set in the minor key and are especially adapted for souls burdened with care and sorrow and sitting in darkness. They present only one side of the Christian life, which can be supplemented by counsels for integrity, bravery, and constancy in the struggle for daily existence which encompasses the bulk of humanity. Written by a monk, its intended target audience were for persons with a full-time religious vocation, rather than those involved in the secular world. It lays stress on the passive qualities and does not advocate active service in the world. What makes it inspiring to most Christians is the supreme emphasis it lays upon Christ and the possibility of immediate communion with him and God. The primary Protestant complaints about the book are with regard to what they might call medieval superstitions: the merit of good works and transubstantiation (IV:2 - i.e., volume IV, chapter 2), purgatory (IV:9), and the honoring of saints (I:13, II:9, III:6, III:59). These aspects of Kempis's writings, however, are in full conformity with the Catholic faith that he practiced and with the Catholic faith today. Thomas a Kempis's name will be remembered because of his well-read book, the Imitation of Christ. Priests, nuns, and lay people have used it for hundreds of years, and it has helped many to become better Christians. Some claim that his book's spirit is so beautiful, that one would almost think that an angel had come and told him exactly what to write. An effort for his beautification was undertaken in the late seventeenth century, but did not proceed beyond its initial stages. 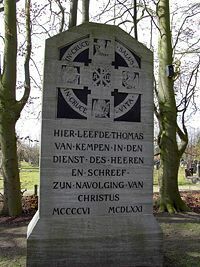 A monument was dedicated to Thomas' memory in the presence of the archbishop of Utrecht in St. Michael's Church, Zwolle, on November 11, 1897. Read Imitation of Christ online – www.ccel.org. Thomas à Kempis – The Catholic Encyclopedia. Quotes from Thomas a Kempis - The Quotations Page. History of "Thomas a Kempis"
This page was last modified on 8 December 2015, at 20:28.